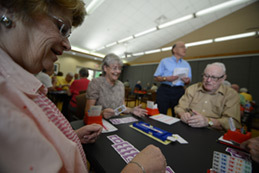 Social, recreational and educational programs previously offered at Sycamore Senior Center will now be available through senior service partners in the community such as The Sharonville Senior Center, The City of Blue Ash, Council on Aging, Springdale Recreation Center, Maple Knoll Village and others. Maple Knoll Communities' staff is working with these organizations to ensure the services and care that are currently being provided to those in the community will be able to be accessed at their facilities. Select social programs will be offered on the Maple Knoll Village campus and Home Health Services will continue to be offered through Maple Knoll Home Health. 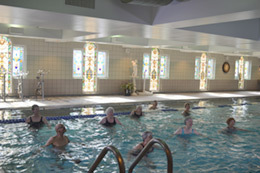 Existing members have the opportunity to join the Hemsworth Wellness Center, on the campus of Maple Knoll Village, at a discounted rate. SilverSneakers is also available to qualifying individuals at no charge at this location. 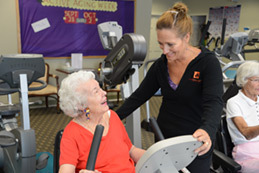 The goal of the Hemsworth Wellness Center is to enhance the quality of life for older adults by increasing independence and the ability to perform activities of daily living. One of the many dedicated staff members will work with each participant to ensure that their individual goals and interests are met at a safe and healthy level. Exercise Physiologists and Fitness Specialists are available to guide your first evaluation and lead you to perform safe participation in the necessary programs. Physical and Occupational Therapists are available to assist you through the Maple Knoll Therapy Department. Other members of the team working to help you are: Aquatic Instructors, Massage Therapists, Yoga Instructors, and Guest Presenters. The staff, facilities and programs are all geared to help you make positive changes within your life. Please see the list of scheduled classes below that can help you achieve your health and fitness goals. For more information, please contact the wellness center at 513.782.4340. Their team is made up of healthcare professionals and advocacy communicators whose mission is to be the top online resource educating the public on the risks of senior abuse in an attempt to save lives and rebuild shattered trust.